By now you've undoubtedly heard that I wrote a book called The Fermented Man: A Year On the Front Lines of a Food Revolution, and are aware that it came out several weeks ago, after a many-year journey through illustrative meta diets, weird French Fries, rotten shark meat, and the publishing industry. By now, you have undoubtedly picked up several dozen copies for all your family and friends, and have hungrily read through your own copy while relaxing on the beach with your citrus-infused IPA of choice. I think the book is a an interesting read whether you're into fermentation already or not, and I hope it reaches the mainstream enough to bring some new people into fermenting. That's the goal, ultimately — to spread fermentation awareness, as well as entertain. But to achieve that goal, I obviously need to reach many people who have never previously heard of me or my writing. There are, in fact, a few very simple things you yourself can do to help me make this book a success. First, after you're done reading the book, please consider writing me a review on Amazon. However you feel about the site, it plays a major role in how people shop for books these days, and from what I understand, reviews factor heavily into a book's visibility (due to Algorithm Stuff). The more reviews the book has, the more likely it is that shoppers who are interested in other similar narrative non-fiction food books will happen across it. Doesn't have to be a long review — even just a few sentences. It makes a big difference and I hugely appreciate the feedback regardless! So honestly, that's the big one right now. Secondly, and more obviously, is just telling everyone you know who might be interested about the book. Word of mouth and social media discussion can go a long way in building momentum in the early stages of an indie book's release. Finally, if you own a small aircraft, another easy way to get word out about the book is to make one of those word banners that you always see at the beach trailing behind airplanes. Simply make a gigantic banner that says something along the lines of "The Fermented Man - A Year on the Front Lines of a Food Revolution is in stores now!!!!" and trail it behind your airplane while you fly around your region, or the closest beach. Thank you very much for helping out a dude who really likes writing books. I hope you enjoy it. Finally! The Fermented Man: A Year on the Front Lines of a Food Revolution is available today. Get your copy (physical or e-book) from Amazon or Barnes & Noble. Or stop by your local independent book retailer and support small business! Also, catch me at one of my upcoming events, including this Friday at Inquiring Minds in New Paltz, the Beer Belly in Albany on Saturday night, and the Rhinebeck farmer's market on Sunday with Oblong Books. The Fermented Man: A Year on the Front Lines of a Food Revolution follows a year I spent living off of nothing but fermented foods, while chronicling their history, cultural significance, and evolution. 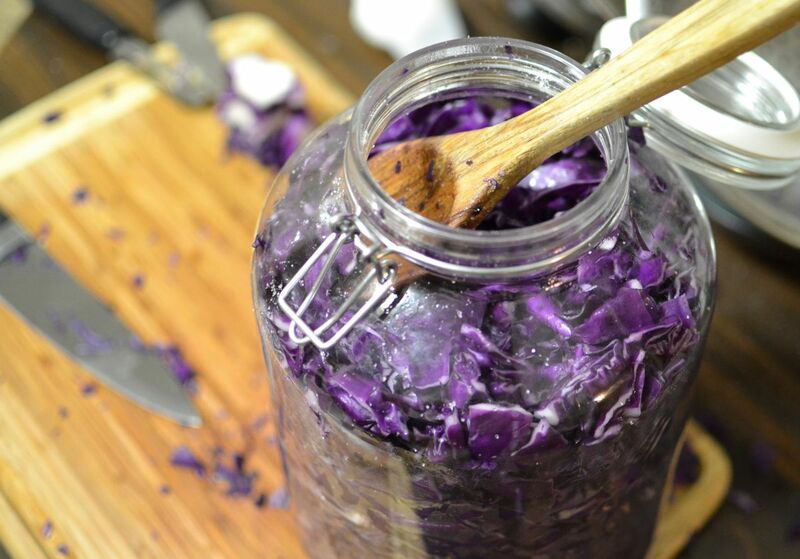 It demonstrates that fermented foods are so varied and ubiquitous that you could literally live off of them, if you were for some reason so inclined. It's informative. It's occasionally somewhat funny. It's contemplative. It's got drama. To say this diet was not easy is an incredibly understatement, but the structure of it — this meta-diet I came up with — allowed me to explore the sort of extreme dieting Americans are obsessed with. I didn't start the fermented diet thinking this would be the sort of diet craze I'd be taking to Dr. Phil — I wanted to use it to explore not just fermented foods, but the nature of diets themselves. Anyway, I hope you enjoy it. It's a book that I very much wanted to be approachable and interesting to anyone, regardless of their level of fermentation awareness. Even if you never intend to make a jar of sauerkraut yourself in your life, I think you'll still enjoy The Fermented Man. Tell your friends, tell your family, get them all copies for their birthdays. Besides recommending the book to people you know, and sharing on social media, another way you can give a huge boost to an author (especially a first-time author), is writing a review on Amazon. It seems like a small thing, but Amazon reviews, regardless of their length or content, immensely help a book's visibility. By taking a few minutes to write a review, you'll help to make the book something other shoppers might discover and enjoy themselves. And I'll be really grateful and probably consider you my favorite anonymous reviewer person from the internet. Over the last two years, I wrote a book called The Fermented Man about the importance of fermentation in our diets and lives, and the curious things one learns when you live off of nothing but fermented foods for an entire year. It's a book about microbes, weird foods, culinary history, Americans' obsessions with health trends, and what it's like to follow a hyper-challenging meta diet. Just wanted to let you know that The Fermented Man, while officially technically released this week, is making more of a soft gradual roll-out. Full availability will come next week -- by then most stores, and Amazon, should have the book in stock. An e-book version is available right now. IndieGoGo backers should be receiving their copies over the next few weeks as well. If you aren't ordering online, please stop by your local bookstore or homebrew shop and ask them to keep The Fermented Man in stock, if they haven't already gotten copies! 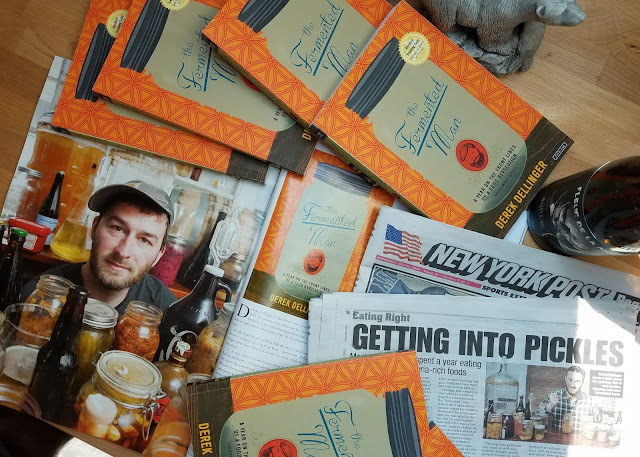 If you are in NYC, come out to Covenhoven tonight (7/20) for a book launch party and Kent Falls rare beer night (there's gonna be some awesome stuff, and a limited number of copies of the book for sale), and if you're in the Hudson Valley, I'll be doing a very cool event with Stock Up in Beacon this weekend, also with beer, and fermented food pairings as well. Beyond that, here's a list of events I will be at for the rest of the summer and early fall. A few things you can do that will tremendously help out a first-time author: please share word and photos of The Fermented Man on social media to help get the word out, and please leave me a review on Amazon once you're done! Both are very small things that are surprisingly enormously helpful for the book's visibility. Thank you for reading, and I very much hope you enjoy the book! The Fermented Man will start hitting stores and releasing through online retailers next week. If you haven't yet, now is a perfect time to order yours through Amazon, Barnes & Noble, or saunter on down to your local bookstore and pick up a copy there. Undoubtedly, after you have hungrily devoured The Fermented Man in one sitting like a person coming off of an arbitrary meta-diet and experiencing guacamole again for the first time in a year, you might have some questions. Things that come to mind that you wish to discuss with me. Given that I am absolutely terrible at responding to emails, what means of exploring these questions could be left to you? How about asking me in person, at one of the many events I will be hosting / attending this summer to promote the book? My busy calendar includes everything from Kent Falls beer nights at fine drinking establishments, to fermented food and beer pairings, to bookstore speaking engagements, to a fermentation workshop on the world's largest rooftop farm, to fermentation festivals, to a hop harvest festival, to me keeling over in a parking lot from exhaustion. This schedule is, of course, not entirely complete just yet. I am open to suggestions, and if you know of a place / business / organization that might be interested in coordinating an event with me, please feel free to reach out at bearflavored [at] gmail [dot com]. More distantly on the agenda, but not yet organized, is a trip to Vermont in the middle of October, and a trip to Louisville, KY around the Shelton Brother's Festival, October 28 and 29. If you live in either of those areas and would like to coordinate an event, hit me up! Finally, after all this is over, having been working on this project for some three and a half years, I will be throwing down a smoke grenade, abruptly vanishing into the night, and spending the next several years in a cabin on some remote mountain peak in Colorado or Oregon, never to trouble myself with the concerns of human society again. At least until I write a book about it. 7 pm going until 8 pm — I'll be doing a reading, followed by Q&A. Facebook event with more details here. Kent Falls beer event, where I'll be answering questions and slinging copies of the book. Fingerprint wild ale will be making an appearance. Stop by from 11 am to 1 pm as I'll be there with books to sign, as well as answering all your fermentation questions. Event page here. Kent Falls beer event, where I'll be answering questions and slinging copies of the book. Fingerprint wild ale will be making an appearance, and many other cool beers besides. I actually don't have any particular specific events schedule at the moment, but we will be in Asheville to brew a collab beer with the fine folks at Burial, and thus hanging out in their taproom quite a bit. Come say hi! Cool festival that's also a great market for picking up fermented goodies, with lots of different information sessions. I'll be participating in the Fermented Reading Room, signing books, as well as at the Fermentation Help Desk, answering your fermentation questions. Signing books and answering all your fermentation questions. Last years first annual Kent Falls / Camps Road Farm hop harvest festival was a really super fun day, actually, This year's should be no different -- we'll be brewing up another wet-hopped farmhouse ale, hanging out and chilling in the brewery while demonstrating the process, picking hops (obviously), and ending the day with a pig roast. Beer is available, hanging out on the farm is available, asking me fermentation questions and such is available, and I'll be in the brewery with copies of the book as we're brewing. Beer dinner with Kent Falls and Grimm. 4 pm — I'll be doing a reading, followed by Q&A. Is The Age of the Flagship Beer Over? This here marks the second entry in a loosely connected series exploring the development and evolution of a new brewery's beer lineup, and how a brewery goes about refining such a thing. Part one went into the background of what we decided we should brew at Kent Falls, while a third future installment will eventually expand on the evolution of a particular beer, our Field Beer farmhouse ale. Field Beer was, from the start, intended to be sort of a 'conceptual' flagship ale, embodying an ethos that represented the whole brewery, if not necessarily leading the brewery in sales or release volumes. Everyone knows that craft beer has dramatically shifted the way that the whole of the adult beverage market works. Before I even jumped into the process of helping to launch a new brewery, and planning and brainstorming and stressing and speculating what beers that I wanted to make would also be practical and sellable to the public, I had noticed something interesting about the way that breweries present themselves to their consumers. For years, maybe ever since the craft beer movement first began, its trajectory has been that of slowly and silently killing the model of flagship beer offerings. It has been one long history of flipping the way in which a brewery works. For years, a brewery was a brand. Not a place or destination or personality or cult or whatever breweries are to the public now. The clarity and message of the brand was the product; the brewery as a personality was only really relevant so far as it was part of the brand. You didn't expect them to change what they were doing or switch things up on a regular basis. You were either on board with their brand, or you weren't. And while most of these brands did offer several products, they were usually slight variations on that initial core brand. Rather than releasing a distinct new brand with a separate identity, for example, you marketed a "light" version of your existing flagship brand. Until recently, and even probably still now, this had a huge impact on how the average person would think about and discuss beer. For decades, the focus had been on a brewery as a brand. So that when you would talk to people about beer, most people would say things like "I had that Dogfish Head beer last night," or "You know what you would like? This one beer from back home, Troegs... you'd like it." And so on. The previous model of brewery-as-brand still greatly affects how the average person sees a brewery-as-a-business, even though it hasn't been that way for most breweries in decades. How many breweries today focus almost all their efforts on one single beer brand? I mentioned that I view this as a slow trajectory, and I think there is an evolution in brewery identity that has been going on since the 70's. Those people that talk about a brewery as if they only make one beer would be wrong in almost every case, but you can understand why, if they don't really have much interest in the nerdy details of the beer industry, they might see a brewery like Sierra Nevada as a singular brand largely embodied by Pale Ale. That type of consumer would only rarely notice that there are other offerings from the brewery, and if so, probably understands that seasonals and special releases are a thing, and don't detract from the core identity of the brewery/brand. In the first wave of craft beer, this view would still basically be perceiving things accurately. Sierra Nevada was built by Pale Ale. That is still the core of their identity, though they happen to make many other products, too. And to the public, Sam Adams is just... Sam Adams. That's the beer. That's the brewery. That's the brand. But because they're a craft brand, sure, they also do sometimes have a seasonal release on tap as well. In the majority of bars, ordering a Sam Adams would create zero confusion. Only the pedantic beer nerd would protest: "But they make like 300 beers! Which one do you mean???" The founders of the craft beer revolution largely stuck close to the existing model, focusing on flagship brands, but generally expanding this concept into having a group of "core" offerings, plus seasonals. This became the basic template for almost every brewery of the next several decades. Gradually, though, the obviousness of the flagship offering (and its singularity as the brewery's identifying brand) eroded. A flagship became merely the most prominent beer in a broader lineup of core offerings. Is 60 Minute the most popular and common product made by Dogfish Head? Sure, but they're a brand built on experimentation, and thus variety; it would be hard to miss that bigger picture. One or two flagships bolstered by seasonals and special releases soon became half a dozen core lineup beers bolstered by seasonals and special releases. Much of this shift was likely tied to the resurgence of the brewpub, which, for most casual beer consumers, would start to define their image of what a brewery was. At a brewpub, having a clear and obvious single flagship isn't necessary, and from a branding perspective, doesn't even really make sense. As more and more began to define this new wave of breweries by their Friday-night-dinner experiences at a brewpub, the expectation that a brewery would offer a lineup of six, up to maybe ten core offerings, with a few side experiments that change every now and then, worked its way into our consciousness. And I'd say that's maybe where we've been for the last twenty years or so. In that sense, the flagship beer is kind of already dead. Most breweries now don't expect to have one huge mega-hit that accounts for 90% of sales. In the rare cases where that does happen, it looks shockingly anomalous. How weird was it that The Alchemist, one of the most talked about and sought-after craft breweries in the world for a good part of this decade, only made and sold a single beer for a long chunk of that time? 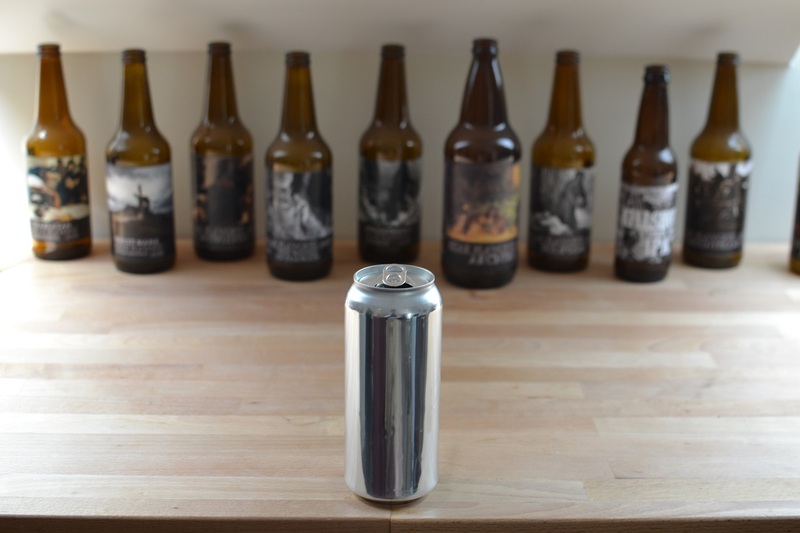 That Heady Topper stood as the sole offering of an immensely popular and beloved brewery was highly unusual for the time, probably because it wasn't even the brewery's intention for this to happen, but the whim's of fate and the wrath of mother nature. Starting a new farmhouse brewery in a demographically-oddball rural area, we knew that a tart saison (or any kind of saison) was going to be a hard sale as Kent Fall's primary brand. You'd be surprised at how hard it is to sell large volumes of saison in the current beer market. Yes, I know, that probably sounds like a personal problem. "Have you considered that you only think that because you are terrible and no one likes you or your beer?" is probably your response, and while you are right, don't take my word for it. Ask any brewery that's producing a lot (or a majority) of farmhouse ale — unless their product is sour or barrel-aged. It may seem like saisons are super hot right now, but I think beer nerds talk about saison more than the general drinking public actually buys them in large quantities. In other words, it's a style that may do really well in special release formats (especially, again, if it's barrel-aged or has fruit or some other specialty situation), but saison is not dominating volume the way that, say, IPAs are, or session IPAs for example, or fruited IPAs, or to pick another random example, fruited session IPAs, or fruited session IPAs with citrus zest, or hard root beer. Saison is one of those styles that's beloved, but puts you in a weird spot if you want to make a lot of it. Anyway, we anticipated this when thinking about our core lineup of beers, and came up with several concepts for "core" beers, though being that most of them were still in the farmhouse vein, we still ended up brewing for variety much more than we had anticipated. I'm guessing this is a common experience for many new breweries these days, unless you're focusing on hoppy beers for your flagships. Hoppy beers are probably the category that remains very easily (very easily) sellable as flagships or core brands, but in order to start off pushing hoppy beers as your primary offering, you either need to have put in the planning years in advance to procure awesome hop contracts from the start, or else be so small that you can still round up the hops you need from spot and trading. In other words, I don't think there are many styles remaining that are particularly easy to push as your flagship offering. And that may be a symptom of how drastically the entire brewing industry has changed. Variety, for now, is king. The real interesting question for me, is: just how sustainable is a model of "variety, always" actually is for every type of brewery, big and small? If you enjoy my writing or reading about fermentation in general, please consider pre-ordering my book, The Fermented Man, on Amazon, and follow me on Twitter and Instagram for more regular updates.